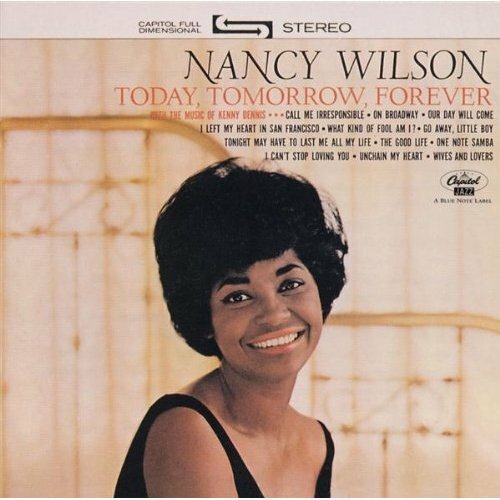 Song of the day: Nancy Wilson – "One Note Samba"
I’m playing you today’s song because it appeared on television last weekend in an old music variety program. The show was called Dig We Must (hosted by a male musical duo called Bobby and Laurie), and it first aired in 1966. One of the songs performed on Dig We Must was something called “One Note Samba”. (I’d never heard it before, and its title wasn’t shown on screen when it played, so the Internet was pressed into service to discover its identity. Thank you, Internet.) A woman and two men (one on either side of her) looked very hip ‘n’ happenin’ as they sang “One Note Samba” in a Big Band kind of way. It was excellent. Although every single aspect of the song was fabulously, wonderfully, hip ‘n’ happenin’ly cheesy, what really made me sit up and applaud were the lyrics. You are currently browsing the archives for the Nancy Wilson category.